A thousand kilometres ago we started our journey in Johannesburg and now we approach the end of our trip and the start of a new adventure. After a short drive into Gonubie we arrived at the Harzenberg residence. The first thing we noticed were huge walls and gates around the property. After visiting Judilie and her family in Bloemfontein we were already aware that this was the South African way of living. We rang the bell at the gate and Rose answered almost immediately. "Oh, you are finally here!" she said. We had been communicating via email, skype and facebook and now the time was here to finally meet each other in person. Rose gave us a big hug and stated again she was “over the moon” to finally meet us. Rob, Rose’s husband, rocked up to meet us and before we knew it we were talking like old friends. We would continue to do so for the next two weeks, non-stop. It is very strange that we meet people in life that will be your friends from “wo to go”. Like-minded and ready to take the next step forward. Rose asked us some months ago to help her set up the first-ever health and wellness convention in Gonubie. She had already done a lot of the footwork and now it was time to put things in place. The next two days were filled with talks about who and what and where. It is always difficult to start something new because people do not know what to expect and are hesitant to enrol just in case something is not what they want. The first few days we only had a few people that were interested so we decided to go and do some marketing in person. Rose took us around to the gyms and swimming pools. Many gyms have got the swimming pools in the same package so that made life a bit easier. Quite a few managers were impressed by the idea’s we put on the table and in the end, we ended up with a large group of people to join us for the conference. In the days leading to the conference, Rose took us to her Aqua classes in the Gyms. The age groups a bit older than the groups we are used to, but we enjoyed every one of them - lovely people and very appreciative towards Rose for what she had done for them so far. We gave Rose lots of new ideas she could use and we did some small presentations for the participants. One of the ladies in her 80’s was so wrapt she wanted to do more and more. Marie Knoetze was her name and she told me that she only started with Aqua when she was 79 and she was sorry she missed so many great years of fun and exercise with Rose. We promised to do an entertainment session for all of them which we did the following week. The tiny pool was chock-o-block full, and the participants enjoyed the music of our choice and costumes to go with it. Elvis Presley, a nun, two clowns and a few characters from The Lion King stole the “wet performance”, and everyone sang along with the South African music we selected. More and more people walked in from the Gym to see what was going on. The manager later told us he had never seen anything in his life like this before and he would love to do something like this in his Gym more often. We suggested he talk to Rose to make that happen. At the time, Rose was getting really nervous about that idea but we told her we would assist her in many ways and give her a speed course to bring her up-to-date. I can easily say now that Rose has done a great job and picked it up like a true pro! One of the major dreams I always had since I was a child was going to a gospel church. I used to say to my Dad, “Why don’t we have churches like this in Netherlands, Dad?” And he'd say to me that it just wasn’t possible in the Netherlands, but maybe when I was older I could try and visit one then. He would love to hear that his wise words became a reality many years later. Unfortunately, I cannot tell him anymore but I know in my heart he knew I would make it happen some day. Greg also wanted to do this and we discussed it with Rose and Rob. Rose told us she has Native African friends that they live in an area where only dark people live. If we wanted she would organise for us to go there. Both of us said, yes please, and Rose contacted her friends. When the Sunday morning of the service was there we got in the car early to pick up Rose’s friends. We met them some time later and they drove us into the suburb of Gonubie. The scenery changed, no “white” people anymore only “dark” people. No offence to anyone, I hope, for me using the words black and white because I believe in people being good or bad, no matter what colour or religion. More and more people flooded the streets and I had to think about the song “In the Getto” by Elvis. Strange that your mind plays tricks on you sometimes. We drove around for about five minutes and I saw a great stack of people gathering on a street corner. I asked Rose’s friends if these people were going to the church as well? She laughed and said, "No, they had a party last night and they are still going". Must have been a great party with 100 people or so still going at 10.00am in the morning. We arrived at the church and got out of the car. Two choir/elders wearing red and white traditional costumes met us in the yard and invited us all in. We met the reverend and he told us he was blessed to have us in their middle for the service. After entering the church we looked around and noticed that Rose, Greg and I were the only “white” people in the church. The service started and the choir of about 40 members started singing. I can still feel the Goosebumps coming up. What a sound! So powerful, it nearly took the roof off! Hundreds of people singing and clapping to the songs. Shortly after the surprise was ready to be let out. The reverend asked us to come to the front of the church and we received a proper welcome and a song just for us. Each of us was asked to say a few words to the congregation. We got a roaring applause from all of them and returned to our seats. I will never forget this as long as I live. No music machines but drums and vocals to back up words. Young and old people just happy to be there and praise the Lord for everything they had. Amazing. After the service we went to the local “cafe”. They call it the local “Braai”. It is like an Aussie BBQ but they use something like a pizza oven with wood and coals underneath to cook the meat. Four men were literally running from one to the next “Braai” to cook the meat for heaps of people. We found a spot in the back of the yard and we watched the “Braai” complete. Springbok and chicken looked like the meat choices of the day and after the smoke disappeared the “African waiter” put a big plate in front of us and we “dug in”. It was beautiful and all of us enjoyed the local establishment to the fullest. We got a lot of looks from the other diners because we looked somewhat different, but the smiles came out when we told them we loved the food and their company. It was warm in the sun and after a while we decided to leave the cafe. We found our car again and got in. The locals looked at us like we were from another planet, but because the girls were with us they let us pass no worries. I don’t think I would ever go into the Gonubie suburb by myself. You see things on TV and this experience came very close to a scary movie on a Friday night. Rose smiled and said, well what did you two think of this? We really enjoyed the church service - and the visit to “the ghetto” was an eye opener. A few of the local kids followed the car and smiled and danced along the way until we came to the outskirts. After dropping the two girls off and got back in Rose’s car we were quiet. What an amazing experience we just had! Rose’s husband, Rob, laughed out loud when we told him the story about the church and the visit. "Well that’s Gonubie for you," he said. In the weeks we stayed with Rose we enjoyed a lot of Rob’s cooking. He made us “Braai’s” at home and cooked us “springbok”. He would do a great job on My Kitchen Rules or Master Chef, it was delicious! The weekend of the convention came around pretty quick and Greg had to change a few things because some presenters decided to withdraw for different reasons. Greg is very good at stress management and he swung things into place. The convention turned out to be a huge success and Rose and all participants were “as happy as Larry”. We would love to go back one day and do it all over again. The good thing about working overseas and travelling the world is the amount of beautiful people you meet, and the experience you have with different situations are many. 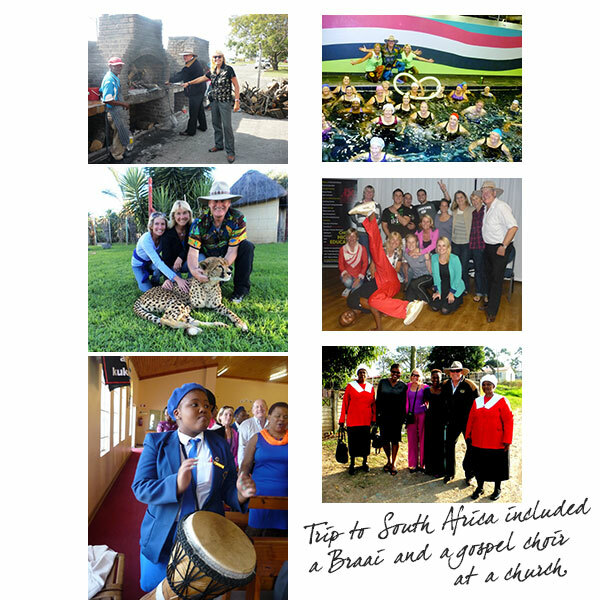 The last week we spent in South Africa we went on Safari - so do not miss out on Part 3 of Aussie Footsteps Go Wild! It is breathtaking to see what happened.